WANT TO MAKE SURE YOU ARE REGISTERED? Special Launch pricing through January 23rd at Midnight. At the time of check out, you will have the option to add the 2020 Austin Marathon & Half Marathon for an additional discount! Receive an additional $10 off the 2020 Austin Marathon or Half Marathon. This offer is only available at the of 3M Half Marathon checkout and can not be applied later. Anyone caught attempting to sell or transfer their race entry/bib to another person or participate in using another participant’s race entry/bib as part of a non-approved transfer, will have said race entry/bib revoked, be disqualified, and be removed from the race without refund. The 3M Half Marathon Refund/Transfer/Deferral Policy is subject to change at any time. 50% refunds are available until August 13, 2019. No refunds will be available after that date. This policy is necessary because almost all of the supplies and services for the event must be purchased well in advance of the actual event date. 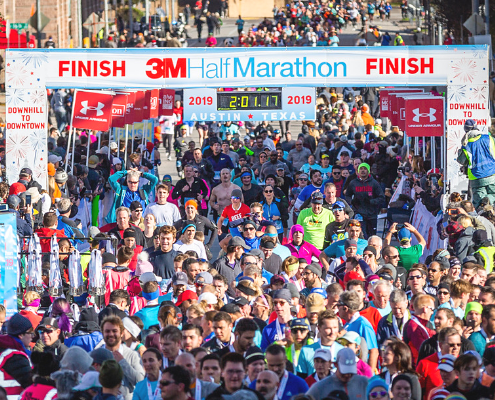 Please email us at info@3MHalf.com to request a refund. In most cases, refunds will be issued to the credit card used during registration and will take up to 10 days to appear on your credit card statement. Transaction fees cannot be refunded. All transfers must be approved through High Five Events. Athletes may transfer their registration to another participant for a $15 transfer fee until 10/7/2019. Transfers after 10/7 the transfer fee will increase to $25. The option to transfer online closes January 06, 2020. For the safety of all participants, athletes may not give or sell their entry to anyone as a part of a non-approved transfer. Transaction fees cannot be refunded. If you are currently registered for the 2020 3M Half Marathon you may apply to defer your registration to 2022 3M Half Marathon or the 2020 Austin Marathon & Half Marathon. Deferrals will assess a $15 processing fee through 10/07/2019. Deferrals after 10/7 will be assessed a $25 processing fee. Once a deferral is submitted, the decision is final and cannot be reversed. The option to defer closes January 06, 2020. Deferrals to the 2020 Austin Marathon & Half Marathon will include the price difference in registration + the processing fee. Once a request has been submitted it cannot be reversed. Please email info@3MHalf.com with your request and confirmation number.